Prasar Bharati Completed 23rd e-auction, 14 TV Channels Won Slot on DD Freedish, where 4 new TV channels coming soon on DD Freedish platform and 10 TV channels renewed their subscription on 19 October 2015. 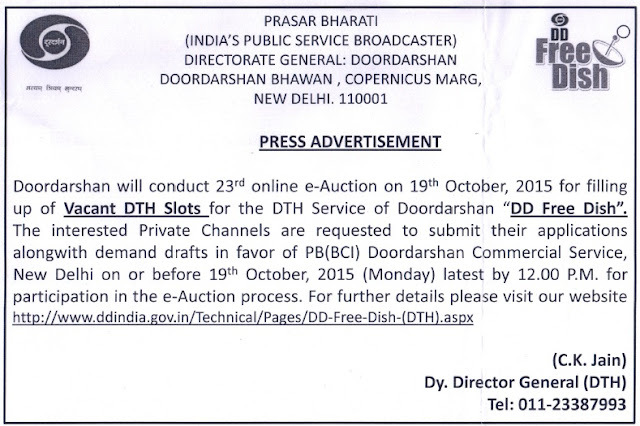 DD Freedish last 22nd e-auction completed successfully for eight channels, where six channel renewed their subscription ( Aastha TV, IBN7 News, Aastha Bhajan, News Nation, Bhojpuri Cinema, and Dangal) and two new channels added at DD Freedish platfrom (Sanskar TV and Wow Cinema). I want to purchase & install DD Direct DTH Set top box. I searched a lot about this on the internet and called different dealers of DTH. But I didn't get a single dealer who deals with this. I also tried to order it online from marginprice.com but the website is not able to log me in. Can you please send me dealer info about the same or tell me from where I can buy this DD Direct DTH Set top box.